According to provisional reports of Census 2011, slum dwellers account for one-third of the total population of Kolkata (4.5 million). More than 40% of these people have lived in slums for two generations or longer ever since the time when Calcutta used to be the financial capital of East India Company. Half of them migrated to the city from rural parts of West Bengal and adjoining states during the 20th century and settled around industrial sites and vacant areas along roads, canals, drains, railway lines and other marginal lands due to lack of adequate housing. Presently, there are 2011 registered and 3500 unregistered slums in Kolkata housing more than 1.5 million people. Majority of this population lives below the poverty line and works as domestic workers, daily wage labourers, factory workers, rickshaw pullers, hawkers and security guards. Adding to their economic challenges are the deplorable living conditions of bustees and squatter settlements that make them unfit for human habitation. Bore well drinking water, poor drainage, unhygienic public toilets and lack of other basic amenities make the slum dwellers vulnerable to health problems like diarrhoea, dysentery, malaria, typhoid, dengue and tuberculosis. In this time of despair, Smile Foundation is providing preventive, promotive and curative health services at the doorstep of slum dwellers in Kolkata. 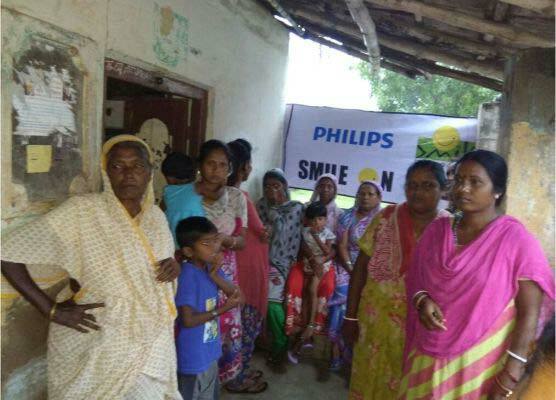 With the support of Philips, it has deployed its Smile on Wheels mobile hospital in more than 20 slums of Cossipore-Baranagar and Howrah areas. The vehicle is staffed with a team of medical experts who offer free-of-cost medical care solutions to the underprivileged families and children in these slums. The services include OPD, ANC/PNC, immunization, lab tests, minor surgery and medicine distribution. Patients with risks to health are referred to nearby government or charitable hospitals for better treatment. Another aim of Smile on Wheels mobile hospital programme is to educate the slum population on the importance of hygiene, healthcare and nutrition. Several IEC activities, street plays and group meetings are conducted to encourage health-seeking behaviour in them. Considering the low social status of women, a major percentage of beneficiaries targeted under this intervention are females, particularly pregnant and lactating mothers. Special workshops are provided by the community mobilizers to sensitise them on ANC/PNC, breastfeeding and related issues. Over 2000 beneficiaries are directly benefited every month through Smile on Wheels. Regular OPDs conducted every month in around 20 slums of Kolkata to provide medical consultation, diagnosis and medicine distribution services. Lab tests conducted for CBG.